We Have Completed An Atlantic Crossing! After exactly 3 weeks- almost to the hour- at sea, we finally crossed the finish line at 9:51 local time yesterday morning. 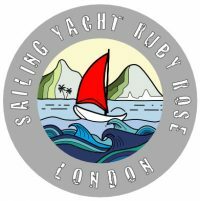 As the foghorn blew, and the voice came over the radio saying, “Congratulations Ruby Rose, you have completed the ARC!” I think it’s fair to say that although we had mixed emotions, relief was a definite front runner. Is that land I see?! I’m warning you, this could stretch out into a fairly long post- but I’m hoping my captivating prose will hold your interest. So, the night of Saturday the 21st (my god, that’s a long time ago now), we went out for pizza and pasta at the local bar, and then retired to bed early. Nick and I had gone past nervousness, past dread, past excitement, and were now like, “Right, can we just get going now?” I think the fact that we slept like babies all night indicates just how relaxed we were feeling. Unbelievable, really- I thought I’d have a sleepless night for sure. But no, after weeks of planning and stressing, it seemed that we’d reached our limit, and we just passed out. Sunday morning: the Big Day! We woke up to rain, which wasn’t exactly what we were hoping for, and although the sun started to shine through during the morning, it looked like a cool and blustery day. We knew we were looking at about 20-25 knots of wind, so we were prepared for that. Up and down the pontoons last minute preparations were taking place and everyone was slowly getting ready to leave. We’d been told to leave the marina between 11 and 1pm, and so Nick and I decided to wait until the majority of the boats cleared out before dropping our mooring lines ourselves. This gave us a great opportunity to wave off Eurpaxia (John and Sandra) and Belafonte (Tim and Magda). There was a real carnival atmosphere as a band was playing and foghorns were… hooting?… and everyone was grinning like maniacs and wishing everyone else good luck, and we’ll see you on the other side!! Eventually, Nick and I looked at each other. “Shall we go, then?” Hell yes!! It was time to depart on our Atlantic crossing. We motored out of the harbour- no turning back now, this is it! !- and suddenly the atmosphere was less jovial and more… grey, wet and windy. And choppy. Lots of chop. 200 boats were crammed into the outer harbour, trying not to hit each other and negotiate the swell and wind at the same time. It was a relief when 1pm rolled around so we could get our sails up and turn so the wind was coming from behind us. We barely registered that we’d officially began- we were too busy holding on and desperately trying to think if we stowed everything correctly! Well, that day was a bit of a doozy. Our previous record for speed was 11.6 knots. We smashed that within a couple of hours to a fairly impressive 15 knots as we surfed down a particularly big wave. Now, I hate trying to guess swell height, but I’m going to go ahead and say the waves were probably around 4-5 metres. We also lost some fruit out of the nets in the cockpit, and, devastatingly, our bean bag from the side deck! How was I going to do all my lounging around on the foredeck now!? After about an hour’s sail we entered the aptly named ‘wind acceleration zone’. Yep, the wind accelerated alright! 40 knots to be exact. We just kept holding on and hoping that once we were away from the islands (which wreak havoc with the local weather conditions by popping up out of a thousand meters of water in the middle of nowhere), everything would just settle down. Well, it took about 3 days for the weather to settle, but that first day was definitely the worst. 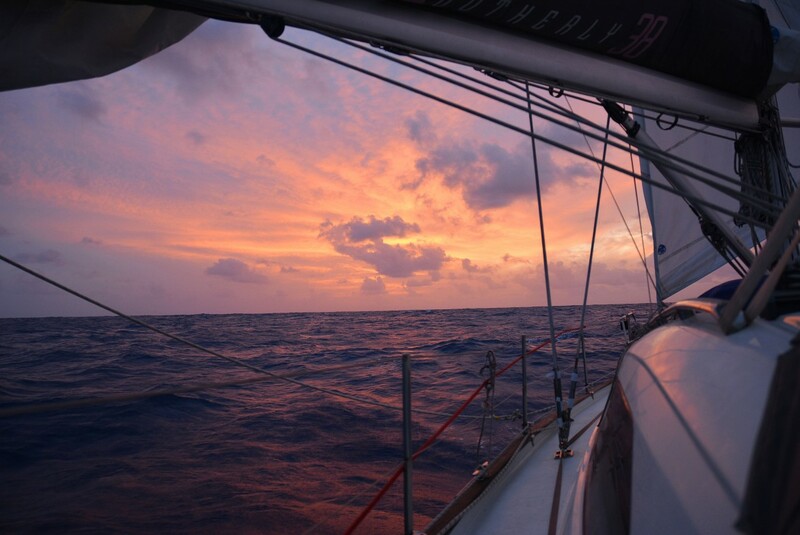 We kept 3 reefs in for those first few days (and still managed to do about 160 miles per 24 hours), and when we were suddenly becalmed on day 4, it came as something of a relief. Day 2- we’ve got a long way to go! Finally, we were able to sleep!! Finally, we were able to cook a meal, have a shower, put the fishing line out, drink a cup of tea without it going everywhere. We were making very little progress, but who cares! The water was the most amazing cobalt blue, we had dolphins (briefly- they didn’t really seem too fussed by our presence), we could finally shed out wet weather gear- life was good! We- and by ‘we’ I mean Nick- took advantage of these benign conditions to rewire the hydrogenerator. After all that fuss getting the thing delivered to Las Palmas, then installing it, then having the Watt and Sea guy tell us we’d installed it wrong and spending a day with Nick fixing it, it was only putting out 4 amps instead of the expected 10. So, Nick, John and Neil spent a few happy hours with their heads in the nooks and crannies where the wires go rewiring the thing. Basically the regulator needed to be moved so it was right next to the batteries, and a different (er, thicker? I don’t know) wire needed to be used. Nick was like, “Oh, it’s so good to have someone on board who knows how to do wiring!” Knock yourself out, boys. Always something to fix! This time- the bin latch. We also caught a massive dorado, it probably weighed at least 10 kilos, probably more, but Nick and John were so trigger happy with that knife that they were half way through filleting it before I had the chance to emerge with my camera. They offered me a shot of its head, which I declined, so you’ll have to make do with some pics of the filleting process instead. Filleting fish off the back of our boat! The first day of lighter winds we decided to bring out The Beast- i.e., the Parasailor. Before leaving Las Palmas we had (okay, okay, Nick had) changed the run of the spinnaker lines through the mast on the advice of the Parasailor Man, and what do you know, 3 hours after hoisting the thing there’s a shout from on deck. I look out the window to see our huge red kite slowly toppling backwards into the sea like a felled tree. Panic ensued, but we miraculously got it back on board without any tears, back into its snuffer sock without it getting all twisted up, hoisted and then flying again all within a couple of hours. Turned out that the line had chaffed through. 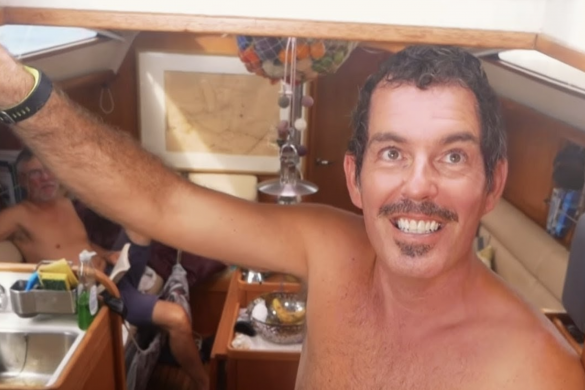 When we got into Saint Lucia we accosted Parasailor Man only moments after jumping off the boat. Parasailor Man just kind of backs away. I mean, what can you say? We’re just grateful that we were able to retrieve it without any tears (the type that rhymes with bears, not the type that rhymes with cheers… although that too!). Sooo, Parasailor worked well after that. We flew it for a couple of days, including leaving it up at night, but once the wind starting building to 20 knots again a few days later, we took it down and just poled out the jib. We ended up sailing goose winged for most of the crossing, actually. The winds were just too strong most of the time for anything else. So, what did we actually DO during the Atlantic crossing? Well, we’d usually do a gybe once a day, especially during the final week. We realised that we couldn’t actually sail directly downwind with our sail configuration: the main wouldn’t tolerate deeper than 160-170 degrees to the wind, which was a pain when we wanted to go west and the wind was coming directly from the east. But, having looked at our track now we’re in, we didn’t do too badly. We think we added about 100 miles to our course, which is the equivalent of about 16 hours. Day 4- still in our wet weather gear but smiling! Anyway, where was I? So, generally the day would start at 12am. Yes, am. I would be up for my watch until 2am, sleep til 8am, then another 2 hour watch. The first week or so, it would be light by the time I got up. By day 21, the sun was rising at 10am. After cereal and instant coffee for breakfast, we’d generally sit around doing some reading, or I’d put the bread on for lunch, or Nick would start on his list of things to fix. We’d usually do emails in the morning, and receiving correspondence from my mother and sister was a boost- especially as they were keeping us up to date with our position in our group. (We finished 6th out of 18 in our class, which we don’t think was a bad effort considering how conservatively we were sailing most of the time.) At 12pm we would have the SSB net for about half an hour which gave us an opportunity to check in with the surrounding boats and discuss any issues, ask questions, compare notes and get advice. Then, lunch. Then, a few hours of fixing things, or, if we were lucky, reading and working on our tans. Dinner started off being just stuff we could reheat, but depending on the weather and availability of provisions, could get quite complicated at times. We had Sunday roasts, home-made chicken pie complete with home-made shortcrust pastry (that was mine… never again on a moving boat! ), sweet and sour dorado, shepherd’s pie, breaded veal with ratatouille (the look on John’s face when I presented him with a vegetable stew… bless! ), as well as a couple of cakes and freshly baked bread once we got the hydrogenerator up and running. It was funny, the first week I was quite bored. 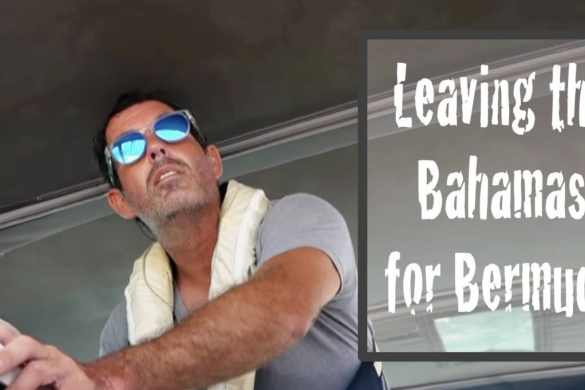 Our pace of life had been so hectic in the lead up to our departure, and I was thinking, “What the hell am I going to do on this boat for 3 weeks? !” Interesting that my main concern was how I would entertain myself rather than any issues that we might encounter with the conditions or our boat. I just had faith, I guess, that we’d done so much preparation and had considered how we would cope if certain things went wrong, that we’d be able to just deal with any problems. And we did! We didn’t thrash the boat, we just sailed comfortably without much consideration given to speed. We had a standing order that everyone wore lifejackets and were clipped on at all times if they weren’t down below. 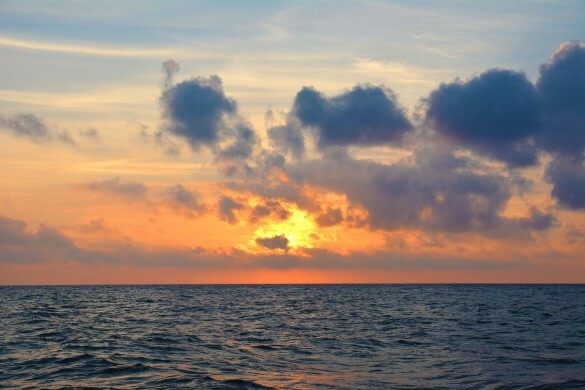 We reefed down most nights in case of squalls, especially after a few memorable early-hours encounters with all of us up on deck trying to reef the main and jib, bleary eyed and trying to communicate primarily with grunts. Reaching half-way was a momentous occasion and we celebrated with steak and a small glass of red. The next milestone was less than 1000 miles to go, and time really started to slow down at this point. We started getting word that ARC boats were starting to arrive in St Lucia and we were suddenly desperate to get over that finish line ourselves. My expression when we sighted land! We rounded the northern tip of the island and saw the yellow buoy and orange flagged boat that marked the two points of the finish line. We had all changed into our crisp white polo shirts, and were looking pretty smart if I do say so myself. As we crossed the finish line, we heard the foghorn and erupted into cheers. A dinghy suddenly appeared and it was John and Sandra with their crew Miles and Phil! I just wanted to leap right into that dinghy and give them a hug, but I managed to restrain myself for a few minutes more: they led us up the channel leading to the marina and locating our berth was easy- there were a few ‘yellow shirts’ waving us in and, to our surprise, a little welcoming committee! Neil’s wife Viv was there with her sister-in-law and her husband, our friends from Belafonte were there and by the time John and co had clambered out of their dinghy, they were also waiting on the pontoon. Usually we check all our lines and fenders before jumping off the boat, and ensure we’ve got everything in its right place- not this time! I just trusted that the yellow shirts and Neil and John had done everything correctly and, as soon as the transom was within leaping distance of the pontoon, I was off! Lots of hugs and well wishes ensued and once we were all off the boat Nick got the champagne out of the fridge and we celebrated properly. Rum punch was soon thrust into our waiting hands- I nearly choked it was so strong, but boy did I need a stiff drink- and we babbled incoherently (or maybe that was just me) for an hour or so with our mates before getting on with the process of checking in. I cannot put into words what a sense of achievement we all feel for crossing the Atlantic ocean. Just to put things into some perspective, among the many incidents that took place amongst the ARC boats, the most serious include a medical evacuation, an amputated finger, a dismasting and a boat that actually sunk. The crew were thankfully rescued by a cargo ship a couple of hours before the boat went under. That doesn’t include the plethora of broken equipment and boat parts, ranging from the annoying (i.e., broken autopilot) to the more serious (i.e., masts coming down, goosenecks breaking, sails tearing, etc). There are as many problems as there are boats. So for us to have no issues that couldn’t be speedily fixed at sea, and for everyone to arrive safe and happy is an achievement that shouldn’t be understated, and I feel mighty proud of all of us, especially Nick who worked twice as hard as anybody else on board and took on all the stress and responsibility in addition to that. Just need a little rest first. Oh, look, we’re in the Caribbean! This will do nicely. Congratulations on making it. Sounds as if a Southerly is the ideal boat for this long distance sailing. Bit far for us but may see you in Brittany sometime. 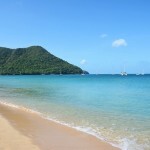 Enjoy the Caribbean and hsve a great Christmas and good sailing in the new year. A great read. So pleased for you all. Carry on blogging. Congratulations! I have really enjoyed following your blog and hope you keep it up during your well deserved R&R. I loved reading this! Gorgeous pictures too. Congratulations on a fantastic achievement and wonderful adventure! A great read and i have been following you with great interest. You all look so relaxed , even though you are in the middle of the ocean with nothing around you, amazing. What a great read. We are very relieved to hear you have arrived safely after your epic journey & hopefully now getting ready to party hard as a reward. I feel very proud for you all. I was very moved by your account and I even shed a little tear. Why? Perhaps was relief to my tension over the last 3 weeks, when every four hours I kept looking at the position of Ruby Rose. Found you by accident while looking for boat info. Terysa, your writing is top notch. I now sail a 26 ft Bristol, just right for my age and situation: (81 winters) In the 1980s I sailed my 35 foot ketch to the Bahamas and up and down the east coast of the U.S. I love sailing and most sailors. The sea would seem to bring out the best in most of us. I am confounded by your choice to load up the boat with pumps. electric motors, electric windlass, etc. I’ll bet you will chuck some of those “conveniences” in time. Remember, advice from the elderly is worth twice that of the youth. My experience has led me to simplify my rig and sail only with items that can be fixed or jury-rigged while away from port. I love your photos and writing; Nick is a lucky bloke and should be thrilled to be your valet and deck hand. Love your blog. I’m the Aussie you borrowed the flag from at the ceremony. I’m sailing in the South Pacific with a mate next year and he has an unused parasailor. Can you tell me which line chafed through in the ARC. Was it the halyard, tack or clew? Is your parasailor hoisted from the mast head or fractional? Hey Dave! The halyard chaffed through. It is a 9/10ths fractional rig. It chaffed through as it came through the the sheave block at the mast head. Hope that helps! Thanks! I’ll be aboard in Feb and will have a close look aloft to see how his mast is rigged. Cat Vs Mono…you know that Cat owners call monos “half boats”! Cruising in Queensland it’s gotta be a Cat!